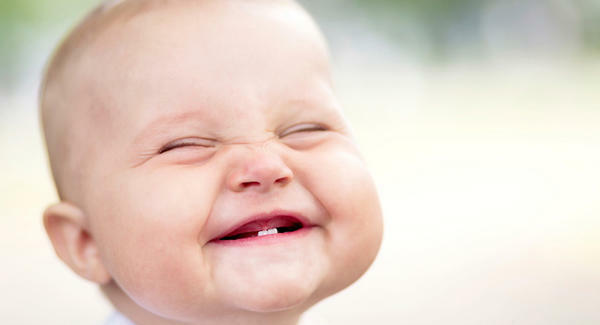 Most babies will develop teeth between 6 and 12 months. Fluoride should be added to your child’s diet at 6 months of age. Massaging sore gums, offering something cold, or acetaminophen, on an occasional rough night, can help soothe your baby’s teething pain. 4. A baby’s body temperature may slightly rise when teething; however, according to a 2016 study in Pediatrics, a true fever (temperature over 100.4 degrees Fahrenheit or 38 degrees Celsius) is not associated with teething and is actually a sign of an illness or infection that may require treatment. If your baby is clearly uncomfortable, talk with your pediatrician about giving a weight-appropriate dose of acetaminophen (e.g., Tylenol) or if over 6 months, ibuprofen (e.g., Advil, Motrin). Make sure to ask your pediatrician for the right dose in milliliters (mL) based on your child’s age and weight. Do not use teething tablets, gels with benzocaine, homeopathic teething gels or tablets, or amber teething necklaces. Stay away from teething tablets that contain the plant poison belladonna and gels with benzocaine. Belladonna and benzocaine are marketed to numb your child’s pain, but the FDA has issued warnings against both due to potential side effects.In addition, amber teething necklaces are not recommended. Necklaces placed around an infant’s neck can pose a strangulation risk or be a potential choking hazard. There is also no research to support the necklace’s effectiveness. You should brush your child’s teeth twice a day with fluoride toothpaste. 5. Once your child has a tooth, you should be brushing them twice a day with a smear of fluoride toothpaste the size of a grain of rice, especially after the last drink or food of the day. Remember not to put your baby to bed with a bottle—it can lead to tooth decay.Once your child turns 3, the American Academy of Pediatrics (AAP), the American Dental Association (ADA), and the American Academy of Pediatric Dentistry (AAPD)recommend that a pea-sized amount of fluoride toothpaste be used when brushing. When your child is able, teach him or her to spit out the excess toothpaste. It is best if you put the toothpaste on the toothbrush until your child is about age 6. Parents should monitor and assist their child while brushing until he or she is around 7 or 8 years old. When your child can write his or her name well, he or she also has the ability to brush well. Ask your pediatrician about your baby’s teeth and fluoride varnish. During regular well-child visits, your pediatrician will check your baby’s teeth and gums to ensure they are healthy and talk to you about how to keep them that way. The AAP and the United States Preventive Services Task Force also recommend that children receive fluoride varnish once they have teeth. If your baby is already going to visit your Dr Donan, dentist in Fresno CA, the varnish can be applied in the dental office. The earlier your child receives fluoride varnish the better to help prevent tooth decay. Nearly all styles of cowboy boots will match well with blue or black jeans, but keep the type of jean in mind. More formal jeans may need a more formal looking cowboy boot that uses solid colors and a material that doesn’t draw unnecessary attention.